The IFA National Returning Officer Jer Bergin has encouraged farmers to attend the Association’s Election debates between candidates for the positions of President and Deputy President, which begintonight and will take place over the next eight weeks before members vote in April. 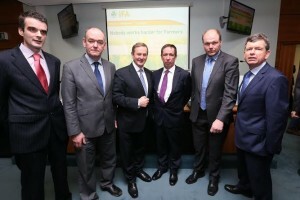 Candidates for the position of IFA President with An Taoiseach Enda Kenny during his recent address to IFA Executive Council: (l-r) Joe Healy; Flor McCarth; Taoiseach Enda Kenny, IFA National Chairman Jer Bergin; Henry Burns; and, Bryan Barry, Acting General Secretary. The North Tipperary County Executive will hold the first meeting in Roscrea at 8pm tonight where candidates for the position of President and Deputy President will debate the issues. The Chairman of North Tipperary IFA Tim Cullinan will chair the debate. Jer Bergin said the debates around the country are an opportunity for IFA’s members to hear presentations from the candidates and to participate in an open forum discussion on farming issues. He said, “The IFA election is unique as it allows every member the opportunity to hear what candidates are offering, and then they have a vote in the national contest. The Executive Council has decided that One Member One Vote will apply”. Henry Burns, Joe Healy and Flor McCarthy are nominated for the position of IFA President. Pat Farrell, Richard Kennedy and Nigel Renaghan will contest the election for Deputy President.